If you're anything like me, and you just happen to be hosting Thanksgiving dinner, you've got nothing but visions of turkey, stuffing, and cranberry sauce dancing through your head. Don't you find it incredibly hard to plan for meals for the rest of the week during this holiday? Especially if you have company in town, it can get a bit challenging to be creative and hit home runs with meals that don't involve endless mountains of pasta. I see your finger hovering over your phone, just itching to dial your favorite pizza place. Don't do it. Put your phone down. Get your nose out of your Thanksgiving menu plans. Stop looking endlessly at Thanksgiving tablescapes, and try this one on for size: Pork Chops, Cabbage, and Apples. This recipe is from Southern Living Magazine (February, 2008), and has held up over the years as one of our favorite Fall one-pot dishes. 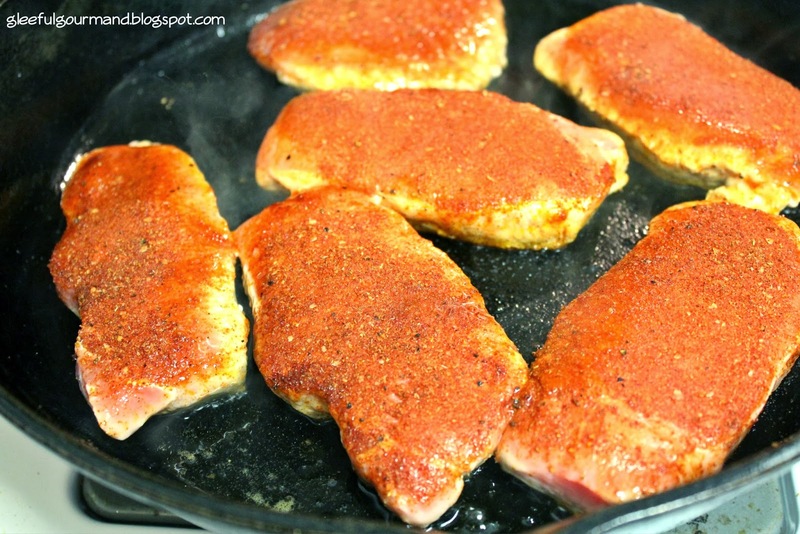 Spiced-rubbed Pork Chops sizzle in a cast iron skillet. Sounds simple, but I promise the flavors are so incredible, you will not only hit a home run, but you will end up thinking you're a bit of a flavor genius for trying it out. Imagine this: spice-rubbed pork chops, sizzling in bacon drippings. 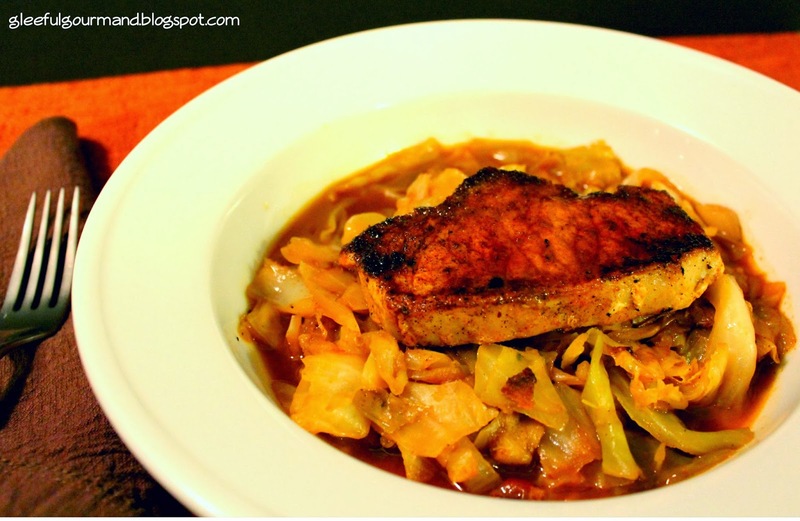 Cabbage, onions, and sweet apple simmering in luscious tomato paste, and your favorite beer. Yes! Beer! You not only get to throw bacon in this dish, but you also get to dump a whole bottle of beer into it. Now what sounds more hearty, more satisfying, and more wake-your-tastebuds-up then that? A whole bottle of beer in your dinner! Hurray! But wait, what's that I hear? You hate Pork Chops? You have memories seared into your food-loving brain of dried-out, tough-as-nails pork chops that you were forced to eat as a kid. These are not those, my friends, I promise. These pork chops are first seared delicately, rested, and then simmered for just a bit, producing a perfect, juicy pork chop. It will change the way you look at pork chops forever. There will come a moment where you think it won't all fit. Don't worry - it will! 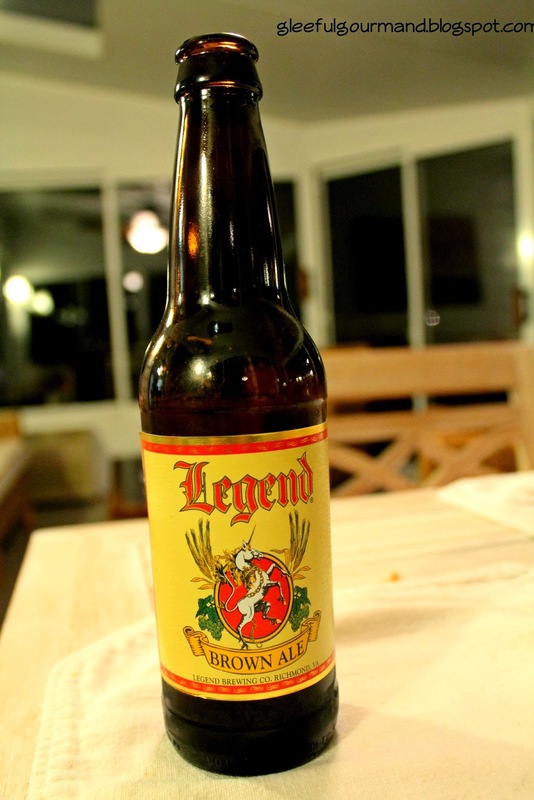 Here are some tips: First, we like to use a favorite Richmond beer, Legend Brown Ale. It's got just the right balance for this dish. 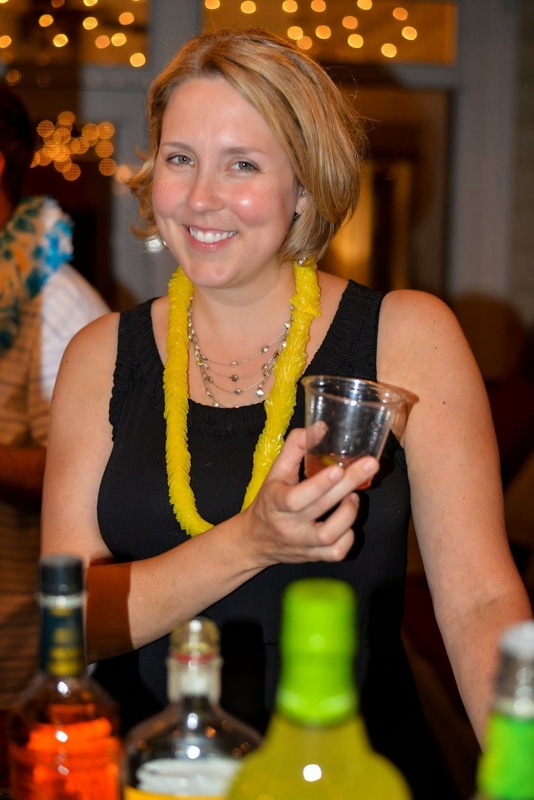 Don't get too crazy with your beer and start throwing in anything that has complicated flavors. Lager beer is best. Secondly, I don't actually ever make this with apples, because my husband is allergic. I substitute the 1 Granny Smith with 2-3 Bartlett Pears (depending on size), and it's still just as delicious. Maybe a tad sweeter. So go on, give it a try. Sounds better than pizza, right? And if you already have your meals nailed down for this week, just think about next week, when there is no Thanksgiving and you're stuck once again wondering what to serve for dinner. Combine 2 tsp. paprika, 1 tsp. fresh or 1/2 tsp. dried thyme, 1 tsp. salt, 1 tsp. pepper, and 1 tsp. fresh or 1/2 tsp. dried sage. Rub evenly over pork chops. Cook bacon slices in a large, deep skillet over medium-high heat 6-8 minutes. Remove, and drain on paper towels, reserving drippings in skillet. Cook pork in hot drippings, 3 minutes on each side, or until browned and done. Remove pork from pan, and keep warm (I like to put them on a plate and cover them with aluminum foil). Crumble the bacon. 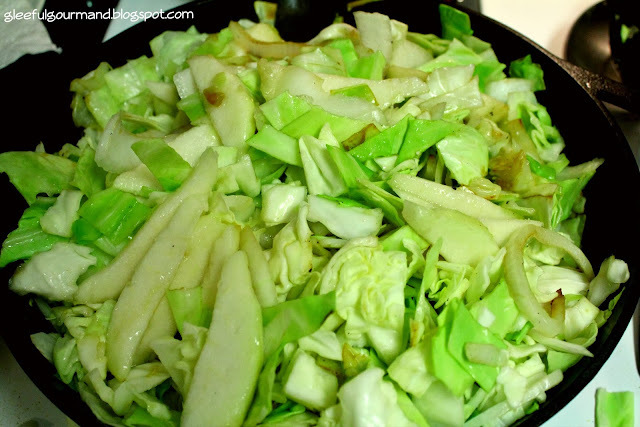 Add cabbage, onions, and apple (or pears) to the pan. Cover and reduce the heat to medium; cook, stirring occasionally 15 minutes, or until the cabbage begins to wilt. Add in the tomato paste, crumbled bacon, beer, and remaining spices, stirring to loosen the particles from the bottom of the skillet. Cover and cook 15 minutes. Add the pork back in and cook, uncovered for 5 minutes, or until thoroughly heated. Serves. 6. Enjoy!